RAW MATERIALS: are basic materials not ready for the manufacture of products. 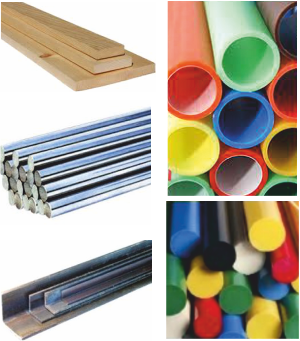 Raw materials have not been machined / processed into standard stock sizes, shapes / forms, that can be used by manufacturing industry, on a production line. They can be transported and handled more easily than raw materials. Standard forms and sizes are cheaper than special sizes, because they are processed in large quantities. Designers use readily available standard stock sizes when designing products. Standard forms and sizes are the same in most countries - an international standard. Natural woods are supplied in standard stock sizes. 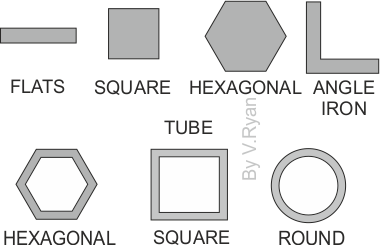 Different sections are available including: rectangular, square and round. Complicated sections are called moulds. They are often used when adding decoration. Some common sections are seen below. Tubes are lighter than solid sections, making them ideal for products such as bicycle frames and other frameworks e.g. scaffolding. 1. What is the difference between raw materials and those that have been processed into standard forms, shapes and sizes? 2. Why are materials processed into standard forms and shapes?